This week my computer crashed, taking with it temporary access to my Charleston photos, with which I had planned to entertain my readers for this post. While I’m waiting on a replacement computer, I hope you won’t mind this re-post of some of my favorite photos of Chanticleer, set to music. Our Charleston workshop began on a chilly, damp day at Magnolia Plantation, a short ride from our hotel. We were there when the gates opened at 8 am. 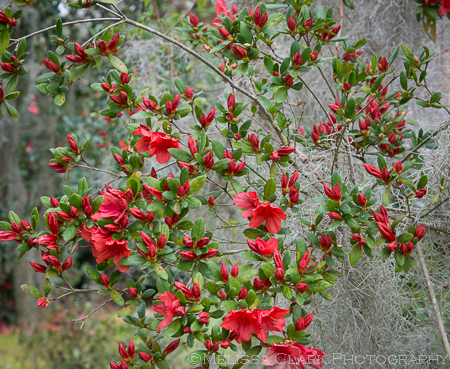 Unlike my last visit, the cold spring weather had delayed blooms on most of the azaleas. So we set out to find other scenes to capture. The “plantation” building at Magnolia Plantation, seen from a distance, with a borrowed 70-200mm f/2.8 lens. Thanks, Alan! As you can see, most of the deciduous trees hadn’t broken bud yet. The exceptions were some wonderful crabapples (I think), like those barely visible on the left side of the photo above. Behind the plantation, tucked away in a hidden nook, I found some others. 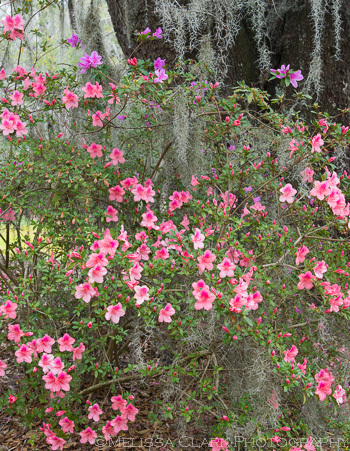 Azaleas were just starting to bloom. The Oak Allee at Magnolia Plantation, with the single azalea in bloom I could find near it. Fire-engine-red azaleas begged to be photographed, so I obliged. Later that week, we visited another destination with ‘Magnolia’ in its name – Magnolia Cemetery. 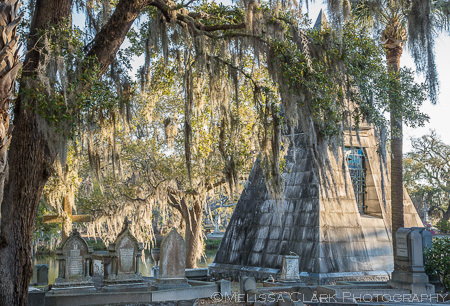 Some of the graves date back to the 1700’s, and the general feeling is one of mystery (aided by the huge live oaks dripping in Spanish moss). Some of my fellow workshop members broke out their infrared cameras once the sun got high; not having one, I tried to stick to less sunny areas but the light was tough. The ironwork around the gravesites was intricate and impressive. Rusted, too. 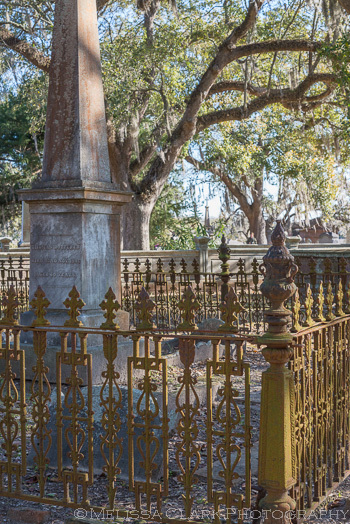 Beautiful rusted ironwork surrounded the gravesites of Confederate soldiers at Magnolia Cemetery. But my favorite image is probably this one, with the river in the background and a mysterious stone obelisk anchoring the right side of the photo, balancing the graves to the left. Early morning sun illuminates the surroundings at Magnolia Cemetery. 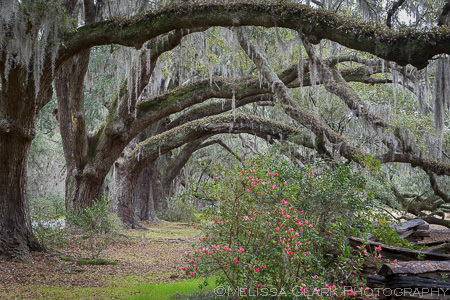 For more of Magnolia Plantation, visit my 2010 post, Charleston Redux – Magnolia Plantation. Part of the “skyline” of downtown Charleston not far from Battery Park and Rainbow Row. Time to visit Charleston – at least as I saw it in mid-March this year. This city is truly a photographer’s paradise in terms of the diverse subject matters there are to explore and try to capture with your lens(es). Although I first visited this area in 2009, this workshop exposed me to so much I had not seen before. And this time I was using a new camera, bought only two weeks beforehand, a Nikon D600. Shooting full-frame at last, and with images captured at 24 MB each, I wasn’t sure what to expect. Fortunately, I wasn’t disappointed – the D600 is a champ! Aside from needing to clean some dust spots off the sensor one night (in my hotel room, under controlled conditions, thankfully), I was really impressed by the detail it captured. One of the afternoons (and one morning) were spent wandering around downtown Charleston on our own. Most of the houses are townhouse style and sit right on the sidewalk. So the homeowners seem to take pride in dressing up their windows with beautifully-planted containers. Even in relatively chilly conditions, the plants seemed to be doing just fine, and brightened up the scene quite a bit. Another window box, immaculately kept. Even businesses “dress up” their window boxes. This image was one of my favorites, not so much for the flowers as the overall ensemble. The shutters and door colors match, but the anchor on the wall makes this image. At upper left, a crape myrtle that has yet to leaf out adds an air of mystery. Charlestonians who live downtown have small gardens that are not unlike those here in Georgetown. They may be postage-stamp-sized but quite glorious. 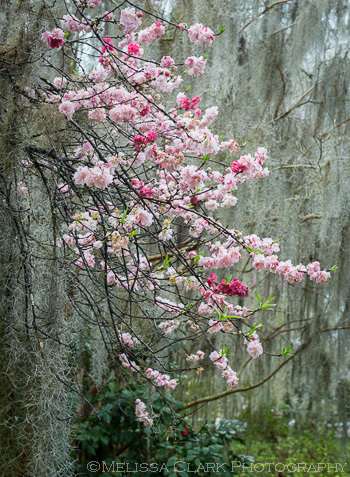 In spring each year, the city holds a “Festival of Houses and Gardens,” which allows entry into some of these wonders. And this year, for the first time, The Garden Conservancy held an Open Days event which included a baker’s dozen of what are surely fabulous gardens, on May 25th. I had to be content with small glimpses into some courtyard gardens, which were lovely indeed. A carefully and beautifully-designed courtyard garden visible from the street in downtown Charleston. Captured with Camera+ by my iPhone5 and processed in Photoshop. Part of a small Charleston garden, visible through a gate. Another peek into a courtyard garden. Crabapples in bloom in a side garden. That’s it for this post. 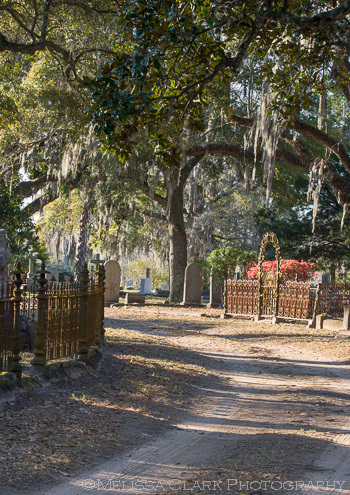 Next time – a visit to two “Magnolia” locations: Magnolia Plantation and Magnolia Cemetery.